TUPPER LAKE — The crew that groomed the town’s James C. Frenette Sr. 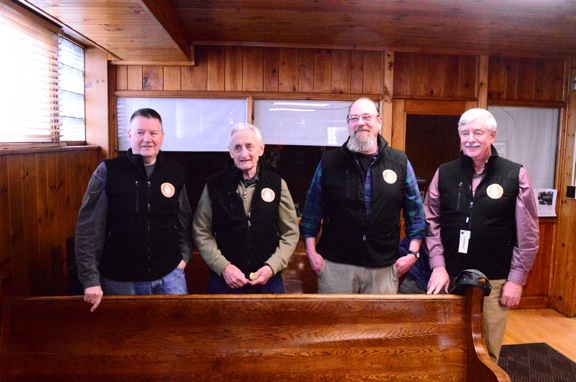 Recreational Trails for cross-country skiing this winter were thanked at the Thursday town board meeting and given new vests with the town’s hemlock cone logo. Jules Callaghan, James Frenette and John Gillis attended the meeting while groomers Scott Chartier and Eric Lanthier could not be there. Littlefield recalled a phone call Gillis made to her right after she was elected to the town board in 2011. He had asked for support in restoring the cross-country ski trails, and she said she thought it was a brilliant idea. Frenette brought a photo of a newspaper from 1973, when the ribbon was cut on the trails. Callaghan had been involved in building the signage for the trails then. Gillis said there were 600 sign-ins on the trail register over the year and 500 people who attended the Tupper Lake Chamber of Commerce’s Brew-Ski event, equaling a guaranteed 1,100 visitors over the season. Chamber of Commerce President Brittany Proulx said Friday that the chamber will give the town a $1,500 donation from its Brew-Ski proceeds at an upcoming town board meeting, in thanks to the trail volunteers and for future upkeep of the trails. The groomers are planning for the future of the trails. Quinn talked about a project to build several bridges on the trail, saying he believed the job could be done for a fraction of the cost of the original estimate by using volunteer labor. “We’ll need some funds from the town … for these bridges,” Quinn said. “I found some,” Littlefield said. Several board members and groomers commented on how the community is very involved in the upkeep of the trails and equipment. Quinn recognized Superintendent of Highways Billy Dechene for his department’s help keeping equipment running, setting up signs and moving snow around the parking lot. The groomers are doing the end-of-season spring cleaning now and the town board has submitted an application for an application for a grant to winterize the golf course’s pro shop.